The military impasse, the stands taken by the Shin Bet and the Mossad, Hamas elasticizing its stance, the Arab Spring and the Palestinian bid in the UN – all of these contributed to Prime Minister Benjamin Netanyahu's decision to present the cabinet with the current Shalit deal, which would bring about the release of about 1,000 Palestinian prisoners. Several architects can take credit for the decision: First and foremost new Shin Bet Chief Yoram Cohen, followed by Defense Minister Ehud Barak, IDF Chief of Staff Lt.-Gen Benny Gantz and Mossad Chief Tamir Pardo. Hamas' architects include Ahmed Jabari, head of its military wing, who was given the go-ahead by Politburo Chief Khaled Mashaal. On Egypt's part, the credit goes to Egyptian Intelligence Minister Murad Muwafi and German mediator Gerhard Konrad. Gantz and Cohen declared recently that they were unable to offer the government a viable plan that would enable Israel to extract Shalit successfully. 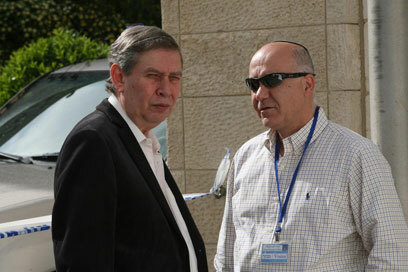 The two reviewed the case upon taking office and both had come to the same conclusion – a prisoner exchange deal was the only way to ensure Shalit's release. Barak reviewed the recommendations and in turn recommended that Netanyahu follow the creed cemented by former PM Yitzhak Rabin: If Israel cannot retrieve captives via a military operation then they must be retrieved via a prisoner exchange – regardless of how difficult it may be. The defense minister played a key role in convincing Netanyahu to accept the deal – and this time both Shin Bet and Mossad chiefs endorsed it. Sources privy to the matter said that Cohen promised the prime minister that his organization would be able to monitor the "heavyweight" prisoners who would be allowed to return to the West Bank, and prevent them from "falling off the wagon." At this time, the actual details of the deal are still unknown, but it is clear that it will follow an outline set several years ago: About 1,000 prisoners will be released in two stages. The first stage, to be executed within a week, will see Israel transfer 450 prisoners to Egypt. Hamas had demanded their release, but they have cross-group affiliation and include many who were sentenced to life sentences. Upon the completion of this stage, Shalit would be transferred to Egypt and then returned to Israel. Two months from now, an additional 550 prisoners would be released, according to a list prepared by Israel. The names of the prisoners included in the deal have yet to be published, but it seems Hamas had to elasticize its stance considerably. Until the very last moment Hamas adamantly refused to yield its objection to the expulsion of many prisoners from the West Bank. Now, Hamas agreed to the expulsion of 203 prisoners. It also had to forfeit its demand for the release of heavyweight arch-terrorists like Marwan Barghouti, Abdullah Barghouti and Ahmed Saadat. Hamas in Gaza had an interest for a while now in securing a deal given the pressure and frustration of prisoner families. However, the head of Hamas’ military wing, Ahmed Jabari, insisted on zero compromises. The group’s Political Bureau Chief, Khaled Mashaal, supported him. However, in the meanwhile conditions changed: Iran recently curbed its financial support to Hamas and the group needs Arab and international donations in order to reinforce its hold on Gaza. Moreover, Hamas monitored with concern the boost in Abbas’ status and needed a propaganda achievement that would overshadow the Palestinian president’s accomplishments. The prisoner leadership in Israel jails recently gave Jabari the green light to secure a deal as he sees fit. Mashaal and Jabari apparently reached the conclusion that they exhausted the negotiations with Israel and received the most they could get. The negotiations lasted for five years and four months. Some would argue that a similar agreement could have been secured a year or two ago, yet this is doubtful. While the agreement constitutes painful Israeli capitulation and would grant terror group Hamas a prestigious, unprecedented achievement that would boost its status, Israel apparently managed to secure some of its demands. Moreover, the stubborn negotiations it conducted will have a deterrent effect. The state of affairs in the Arab world also affected Netanyahu’s decision. The prime minister realized that German mediator Konrad did as much as he could, and that the fate of the talks was in the hands of Egypt’s military rulers. Israeli officials were gravely concerned that this regime could lose its ability to serve as mediator within a few months and come under the Muslim Brotherhood’s influence. Moreover, Egypt’s supreme military council also needed an achievement in the global and Arab theater. Another factor was the situation on the Syrian front. Bashar Assad’s regime endorsed the deal in order to improve its global status. The Syrians exerted their influence on Hamas’ leadership in Damascus to show a little flexibility. Israeli officials feared that this Syrian influence, as feeble as it may be, would also dissipate should the Syrian president be toppled. This is the “window of opportunity” officials in Jerusalem spoke of. This window could have been closed given further upheaval in the Arab world. The change in the status of Palestinian Authority Chairman Mahmoud Abbas as of late also played a role. In the past, Washington expressed its concern that a Shalit deal would boost Hamas’ stature on the Palestinian street, thereby jeopardizing Abbas’ position and Fatah’s rule in the West Bank. Israeli officials shared this concern. Yet in the wake of his UN bid, Abbas’ position was greatly boosted and there is no fear that his stature would take a grave blow as result of the agreement. Netanyahu may have also had an interest in “making Abbas sweat” in response to the Palestinian leader’s conduct on the international stage. Hamas also had an interest in showing flexibility. The ground in Syria is shifting beneath the group’s political leadership’s feet in Damascus and it seeks a new base. This leadership now needs an entry ticket into moderate Arab states, headed by Egypt, Jordan and Qatar. What remains is the substantive fear that the arch-terrorists to be released would restore Hamas’ West Bank infrastructure. Such move could prompt, not far from today, casualties among Israelis - especially should another Intifada break out. This fear, which is premised on solid reasons, will now force the Shin Bet and IDF to significantly boost its ant-terror operations and security deployment in Judea and Samaria while requiring great manpower and additional resources. Moreover, Israel will have to toughen its security demands in the framework of talks with Abbas, while he too will have to further toughen his stance. Abbas will also be forced to decide whether to cooperate with Israel in monitoring the arch-terrorists and their aides, at a time when he’s trying to promote reconciliation with Hamas and prepare for elections. We can only hope that these fears will be proven false and that Israeli society did not stretch the principle of mutual responsibility beyond reasonable limits. See all talkbacks "Anatomy of a deal "